Michel Roux Jr may be a twostar Michelin chef at Le Gavroche, one of London’s top restaurants, but that doesn’t make him immune to the power of his grandmother’s cooking. More specifically, her rabbit served with pastis, a French aperitif with a powerful aniseed flavour. Ahead of his appearance at the BBC Good Food Feast Festival, we picked his brains about his favourite meal, his opinions on so-called clean eating, and his secret for making the perfect steak. You recently opened The Wigmore, which is a London tavern attached to The Langham hotel, where meals start at £12. What do you hope to achieve with this new project that seems more relaxed? The Wigmore is really exciting and fresh addition to the London pub scene. At its heart, it’s a pub more than a gastro pub, and the aim is for it to become the go-to pub in London for the best drinks, food and atmosphere. It’s great if you want to sit and have a quick pint and a scotch egg, or if you want to lounge away the day with a glass of great wine and some food. My cooking generally is known as fine-dining French, so it’s wonderful to have the opportunity to do something a little bit different. I believe that all things should be enjoyed in moderation so for me, a culinary pleasure should not be guilty. I do love good-quality dark chocolate. What are the biggest mistakes people make in the kitchen that infuriate you? The first one would be not knowing when to stop putting things on the plate, and the second is over and underseasoning. What do you think of the “clean eating” movement where foods are deemed wholly good or bad? I’m a big believer in moderation, and I think all foods should be enjoyed as part of a balanced diet. What is going to be the next big food trend? I think a return to unfussy, classic food that’s ingredient led, and perhaps a rise in popularity of British food, post Brexit. What is your least favourite food trend? How do you make the perfect scrambled eggs? Use lots of cream. How about the perfect steak? Cook it on a high heat to start with and make sure you leave it to rest properly. What do you think of the rise of veganism? Do you think you could ever go vegan? Personally, I’m not a fan but I do strongly believe that we eat too much animal protein. What would you serve if you were going on Come Dine with Me? My grandmother’s rabbit with pastis! What food would you avoid eating at all costs? I’m a chef so I’ll try anything once but I’ve never been keen on liquorice. Have you had any near-death experiences in the kitchen? Thankfully not! However we did have a customer that accidentally locked themselves in the toilets recently. What is the most irritating thing a diner can do in your restaurant? Be rude to my staff — snapping fingers or whistling at them, anything like that. 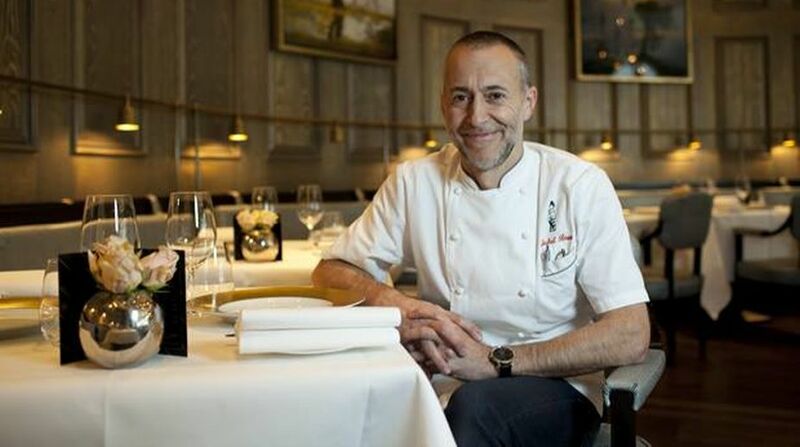 Michel Roux Jr is hosting a night supper at the BBC Good Food Feast Festival in London.